The Belgrave Square home of Irish tycoon Edward Haughey has been described as the Downton Abbey of our times. 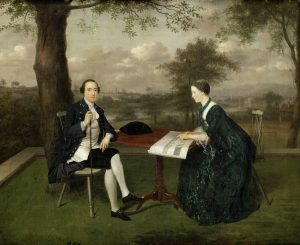 Contents from his extraordinary London home – which formed a backdrop to life at the highest levels of British society – will come under the hammer at Sotheby’s on May 23 and 24. The Kilcurry, Co. Louth born pharmaceutical magnate Lord Ballyedmond (no relation of the late Taoiseach) who died in a helicopter crash in 2014 was a keen collector with very deep pockets. Inspired by the Regency and neoclassical designs of Robert Adam he transformed a once dormant property in one of London’s most prestigious squares into a modern evocation of a great Georgian town house. 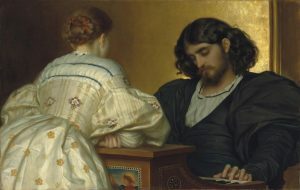 Along the way he amassed a collection of paintings, tapestries, porcelain, silver and furniture. Among the lots are a silver wine cistern capable of accommodating over 70 bottles of champagne. This is a 1992 reproduction of a 1719 original by Paul de Lamerie and is estimated at £80,000-120,000. 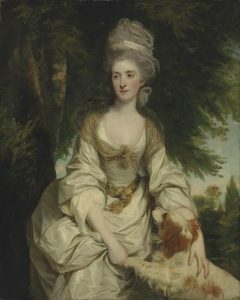 A 19th century dinner service with the arms of the Thurn & Taxis family is estimated at £2,500-3,500, a portrait by Sir Joshua Reynolds of Mrs. Richard Pennant has an estimate of £20,000-30,000 and a Louis XV tapestry is estimated at £12,000-18,000. 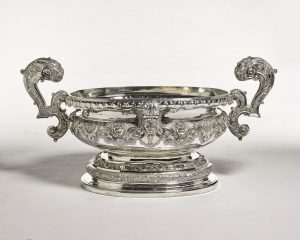 Other lots include a silver aviary, chandeliers, marble sculptures, clocks and collectibles. Born in 1944 Lord Ballyedmond is renowned as only the second person in history after the Marquess of Lansdowne in the 1920’s to have sat in the upper houses of both the Irish and British parliaments. A second sale, the Ballyedmond collection part II: Gentlemen’s Accessories Online, will open on May 23. It will feature objects like cufflinks, tie pins and watches by makers including Cartier, Van Cleef and Arpels, Boucheron and Tiffany. Estimates range from £150 to £6,000. 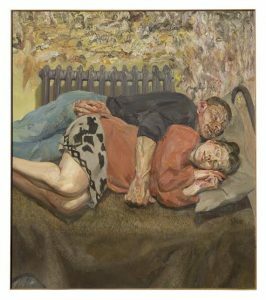 UPDATE: THE sale totalled £4.4 million with bidders from every continents and a sell through rate of 94.3%. Most lots went able the high estimate. 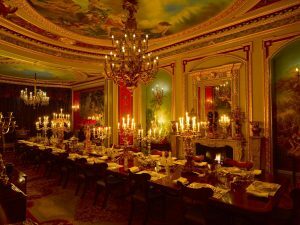 The dining room at Belgrave Square. 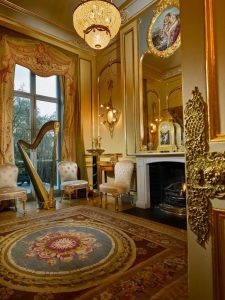 The parlour at Belgrave Square. 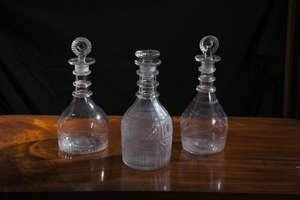 Some impressive results were recorded at the James Adam Country House Collections auction at Townley Hall near Drogheda on October 11, but too many lots failed to find buyers. 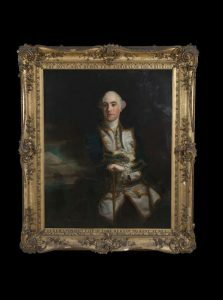 A portrait of Captain John Byron, grandfather of the poet, from the studio of Sir Joshua Reynolds made 32,000 at hammer. 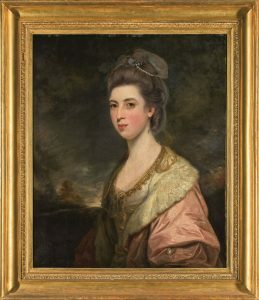 The top lot of the sale, another portrait, this one attributed to Van Dyke made 68,000. 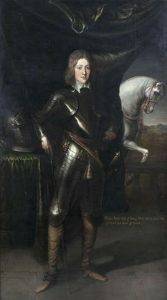 The subject was Thomas Butler, Earl of Ossory. A very rare French flintlock gun – according to the catalogue further research showed that it was made for Louis XVI – made 10,000 at hammer. A rare German 16th century wheel lock rifle made 12,000. A Killarney davenport of exhibition size made 31,000 at hammer, a Killarney tea table made 11,000. 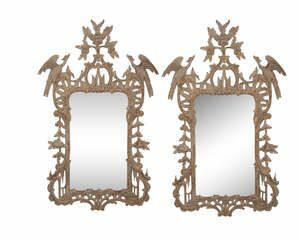 A pair of Irish George III gilt wood mirrors sold for 20,000 and a pair of Great Irish Deer Antlers made 17,000. 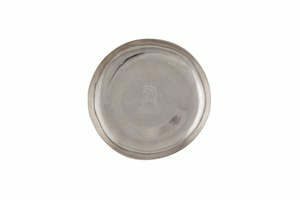 A silver paten on foot, made c1717 by Joseph Walker with a provenance of Malahide Castle, sold for 2,000, a View over Dublin Bay by William Sadler II made 11,700, a large Irish mahogany side table with green marble top c1740 made 9,500 as did a set of four Irish Gainsborough armchairs. 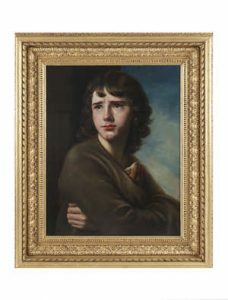 The Spartan Boy by Nathaniel Hone the elder sold for 27,000. A pair of Irish George III tea tables made 18,000, a George III silver table made 4,500, a walnut chest on chest made 4,600, Figures Skating on a frozen river by Frederik Marinus Kruseman made 21,000 and a Regency rosewood library table made 12,000. This Killarney wood davenport made 31,000 at hammer. 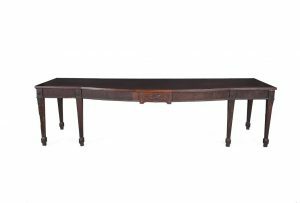 A three meter long mid-Georgian Chippendale serving table is among a number of highly collectible lots at Adams Country House Collections auction at Townley Hall, Drogheda on October 11. More than 600 lots will showcase Irish country house interior decoration. 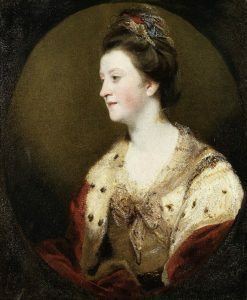 Irish Georgian furniture and some early portraits attributed to Robert Hunter, Sir Joshua Reynolds and Sir Anthony Van Dyke will create international interest. There is furniture and art, garden furniture, silver, porcelain, books, glass, carpets, prints and antique maps. 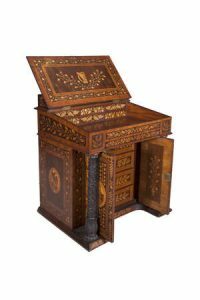 Among other lots of fine furniture are a pair of inlaid and painted satinwood pier tables (30,000-50,000), a mahogany breakfront bookcase (10,000-15,000), an Irish yew secretaire (5,000-8,000), a large brass bound turf bucket (15,000-20,000), several pairs of Irish Georgian games tables and large Williams and Gibton dining tables.